Despite numerous warnings from the Surgeon General that continued use of tanning sprays would only make him look like more of a douche, Boehner vowed to continue using his products. House Minority leader John Boehner’s signature sunless tanning spray has been recalled by Naranja Skin Co. due a growing number of customer complaints. The Ohio representative’s Deep Orange MicroMist Tanning spray had enjoyed national success until numerous customers recently needed to be hospitalized because they suffered adverse effects from using the spray. Thirteen people, in all, needed emergency care when continued use of the spray caused: impaired vision (red only color visible); uttering of nonsensical statements without justification; and a complete inability to empathize with others. Break me off a lil spritz of that Boehn-asty sheeeet! Originally marketed for middle aged men and women, Boehner’s spray surprisingly gained a loyal following amongst the 16-22 demographic, especially in the Philadelphia and New Jersey markets. When word spread of the recall, mobs of orange roided-out fans stormed local pharmacies looking to stock up on the potent spray. 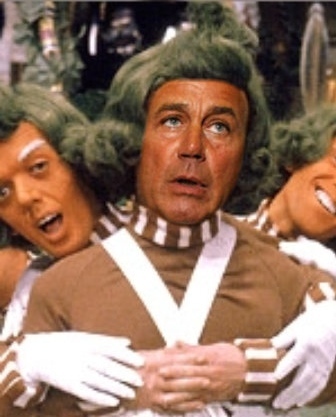 “I can’t go a day without my Boehner’s… son, cause the honeys be loving my orangeness kisses” said one area young man. No word yet if the hospitalized customers are seeking legal action or not.